Citrus blackfly | Infonet Biovision Home. 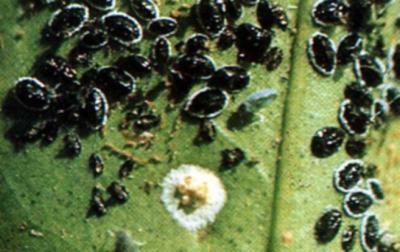 Adults of the citrus blackflies resemble tiny (1.3 to1.7 mm in length) greyish moths. Eggs are usually laid in a spiral pattern on the lower surface of leaves. The immature stages are shiny black scale-like insects and are up to 1.2 mm in length. A white fringe of wax surrounds the body of older larvae and the pupae. The insects are most noticeable as groups of very small, black spiny lumps on leaf undersides. They produce a large amount of honeydew, which accumulate on leaves and stems and usually develop black sooty mould fungus, which cover the leaves blackening the foliage and sometimes the whole plant. Ants may be attracted by the honeydew. 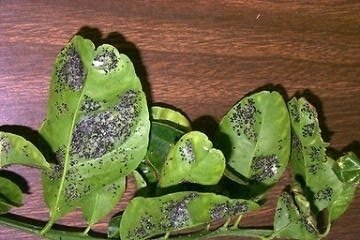 Heavy infestation causes general weakening and eventual death of plants due to sap loss and the development of sooty mould on leaves. Infested leaves may be distorted. Citrus blackfly has been effectively controlled by natural enemies. This is the most cost-effective and sustainable method of control, and the parasitoids are capable of controlling it wherever it becomes established (e.g. Encarsia opulenta, Eretmocerus serius as natural enemies in Kenya). Spraying with neem seed extract (4%) at the emergence of new flush and repeated at 10 days intervals once or twice is recommended in India (Tandon, 1997). In case of localised infestations affected shoots should be removed and destroyed.